During a recent appearance on the "Never Not Funny" podcast, original KISS guitarist Ace Frehley recalled attending the funeral of PANTERA and HELLYEAH drummer Vinnie Paul Abbott last June in Arlington, Texas. "It was crazy, because I had a speech planned, and it went over perfectly," Ace said (hear audio below). "In the church, I'm at the podium, and I spoke for about 10, 12 minutes. And then we get out to the cemetery, and he's in a KISS casket. Vinnie Paul got buried in a KISS casket, and I see my face on the casket, and it weirded me out. But above and beyond that, his father said to me, 'Would you say a few words by the casket?' And I had nothing prepared. I don't know where it came from. Somebody beamed it into my head. I came up with the line… Everybody was looking at me. I said, 'I'm assuming everybody here has seen the movie 'The Wizard Of Oz'.' And I think nobody knew where I was going with that, but they all nodded. There was maybe a hundred and fifty people there, two hundred. And I said, 'Well, remember the part at the end when they discovered the wizard was a fake and he was talking to the Tin Man. And he used the line, 'It's not how much you loved but how much you were loved by others.' And I said, 'Vinnie was that kind of guy. Everybody loved Vinnie.' I go, 'He's up in heaven right now — rock and roll heaven — playing with his brother Dimebag.' I said, 'Thanks so much for having me here. And God bless you.' But I don't know where that came from." 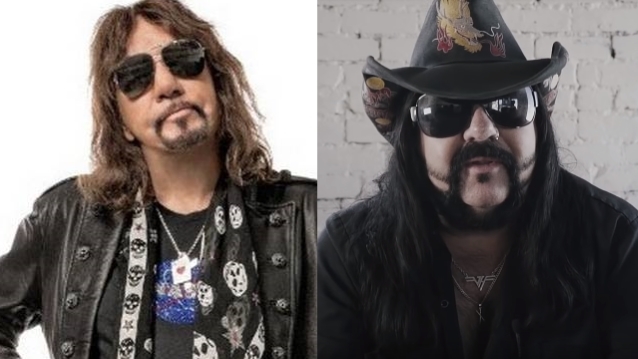 Back in 2015, Vinnie Paul told The Washington Times that his favorite rock and roll memory involved Frehley and the rest of the original KISS lineup. He said: "PANTERA was the opening band on the KISS reunion tour in 1997, with all the original members. We toured with them in South America. We did three nights in Mexico City, then we had a flight on my birthday, which is March 11, and we were on a flight from Mexico City to Santiago, Chile. KISS was in first class, and we were in business class. Halfway through the flight, all four of the original members of KISS came back to me and sang 'Happy Birthday' in four-part harmony. They gave me a 'Kisstory' book. I felt like a 14-year-old kid. I had tears coming out of my eyes." Vinnie Paul was buried in a custom "Kiss Kasket" provided by Gene Simmons and Paul Stanley. The casket was offered as a gift at Vinnie's family's request. Vinnie Paul's brother, late PANTERA guitarist "Dimebag" Darrell Abbott, was buried in the original KISS casket prototype in 2004 after his untimely death. The coffin featured the faces of the four founding members of KISS, the KISS logo and the words "Kiss Forever". Dimebag was also a huge KISS fan and even had a tattoo of Frehley on his chest. In addition, Darrell had Frehley autograph it and had that tattooed to his body as well.